Right now, our lakes and rivers are under attack by Zebra Mussels. In Texas, Lake Ray Roberts and Lake Texoma are already infested — and without your help, they will spread throughout the state. Encrusting and adding weight to boat hulls; clogging water systems used in boat motors, air conditioners and heads. Threatening our water supply by colonizing inside pipelines, restricting the flow of water, and damaging water intake structures which results in higher water bills for homes and businesses. Taking over habitats from native species, damaging lake ecology and impacting fish populations . Unfortunately, you may be “in possession” of Zebra Mussels, and not even know it. That is because young Zebra Mussels in their larval stage can survive for days in water left in your boat and are invisible to the naked eye! 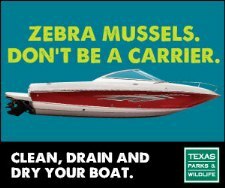 We wanted to make sure you are aware that it is ILLEGAL to possess or transport Zebra Mussels – knowingly OR unknowingly in the state of Texas. The law imposes fines of up to $500 for the first incident (a Class C misdemeanor), and steeper fines with possible jail time, for subsequent offenses. Boaters can take a few simple precautions to help ensure they are in compliance with the law. DRAIN. The law requires that boaters drain all water from the boat, including the motor, bilge, livewells and bait buckets — before leaving an infested lake. DRY. Dry the boat and trailer for a week or more before entering another water body. If unable to let it dry for at least a week, wash it with a high-pressure washer and hot (at least 140-degree), soapy water. Watch this video to see how to effectively clean and/or decontaminate your boat. Thank you for doing your part to save Texas’ lakes and rivers. Thanks to the following Texas Parks and Wildlife campaign partners: Tarrant Regional Water District, Trinity River Authority, City of Dallas, North Texas Municipal Water District, City of Waco, Sabine River Authority, Brazos River Authority, City of Grapevine, San Jacinto River Authority, Lady Bird Johnson Wildflower Center, City of Houston, Upper Trinity Regional Water District, and Canadian River Municipal Water Authority. Sign up for free email updates and e-newsletters from Texas Parks and Wildlife to stay up to date on the latest fishing, hunting and state park information. You can unsubscribe or change your subscription selections at any time. You are receiving this message at Email Address because you have done business with and/or signed up to receive email updates from Texas Parks and Wildlife Department. Did someone forward this email to you? Subscribe now — it’s free!